Detective Morgan Forester‘s resolve was as steely as his gun and the badge he wore with pride. And he’d belonged to Trista Emerson—until a tragedy drove them apart. Now, two of Trista’s clients were dead, and Morgan was back, sexier than ever…and convinced Trista might be the killer’s next victim. Forced with Morgan’s twenty-four-hour brand of protection, Trista had to admit the truth—she still loved him. This time, she vowed to reach the man behind the badge—and show him she was—and always would be—his woman. This book was first published by Harlequin Intrigue in 1999. 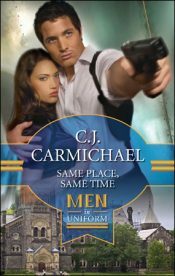 It was re-issued as a "Man In Uniform" book in 2010. When originally published, the book was serialized in the Toronto Star newspaper--just the way stories were released back in Charles Dickens' day! I think the plot of this mystery is one of the most devious I've ever concocted. Let me know if you figure it out before the last chapter! A loud thud woke Trista out of a fitful slumber. She sat up in her bed, heart pounding. Normally she wasn't one to worry about strange nighttime noises, but given all that had happened lately, she couldn't help but feel anxious. She sat still for several minutes, trying to convince herself that either she'd imagined the sound, or it had been something innocent, like a neighbor's cat pouncing on the balcony that ran out front of her one-bedroom apartment. But the thud had been loud. Cats didn't come that heavy. Another thing--pets weren't permitted in this building. After seconds of silence she heard footsteps. Someone was out there. Someone with two feet, not four paws. Trembling, she reached for the bedside phone and Morgan's card, which lay beside it. In the dim glow from the alarm clock she could make out the seven-digit number in the bottom right-hand corner. She punched in the numbers and almost sobbed with relief when Morgan answered on the first ring. "It's me, Trista," she whispered into the receiver. "I think I hear someone on my balcony. What should I do?" "Get out right now." He spoke in short, clipped words. "Go to a neighbor's." "But I don't know any--"
"Get out, Trista," he repeated. "I'll be there in about ten minutes. I'm on my way now." The phone was still to her ear when he hung up. She looked at the digital display of the clock and saw that it was past midnight. The sounds had stopped, but she couldn't quell the fear that churned in her stomach. Easy for Morgan to tell her to get out of the apartment, but where should she go? She shared this floor with three other neighbors but they were all elderly. Should she wake them? Maybe if she just went down to the lobby, she could wait for him there. Her mind made up, she slipped out of bed. She didn't dare turn on the light, so she stumbled awkwardly to the dresser. Yanking open a drawer, she searched by feel and located a thick cotton sweatshirt. She pulled, ignoring the tumble of clothing cascading out with it. Slipping it over the delicate silk teddy she'd worn to bed, she cast about for her jeans, then remembered belatedly that they were sitting folded in a pile of laundry on the dining-room table. She went into the dark hall, stretching her hands to either side, feeling her way along the walls until she came to the living area of her apartment. It was lighter here, thanks to the sheer curtains that only partially obscured the glow of the streetlights outside. Heart pounding, she made her way to the table, slinking along the wall, not wanting to be seen by anyone lurking outside. As she stretched a hand toward the laundry, she shot an anxious look outside, just in time to see a dark shape run past the glass door, grip the wooden railing and vault out into space. "Oh my God!" The reality of the situation hit her then. Her body began to tremble and she had to grip the edge of the table so as not to fall down. Logic told her the intruder was gone now, but her emotions were still focused on the fact that only a pane of glass and about fifteen feet and stood between her and the potential danger. Her shaking increased as she thought about it, and she sank onto the carpet, hugging her arms around her knees. The break-in at her office had at least been free of human form. She could handle an open drawer much better than a human shape out on her balcony. "Trista?" It was minutes later, and she was still squatting at the same spot on the floor, when she heard a voice and the sound of loud knocking against the steel front door. Recognizing Morgan's voice, she worked her way to a standing position, her legs numb from lack of circulation. She went to the door and, with shaky fingers, unbolted the lock, then felt the door pull open without any effort from herself. "Are you all right? Why didn't you leave?" Morgan breezed past her into the room, poised for action with his right hand holding a very serious-looking black pistol. After a quick glance around the room, he turned back to her, the questions in his eyes fading as he registered her obvious distress. "You're pale as a ghost. And shivering." Some of his tension, the readiness for action, dissipated. "What happened?" He tucked the gun out of sight, then placed a hand on her shoulder. "He left." The words seemed to wobble as they left her mouth. "I saw him jump over the balcony shortly after I called you." "Gently, Morgan led her to the sofa and eased her into it, before moving toward the window. Finding the outdoor electrical switch behind the full-length drapes, he turned it on, flooding the exterior with light. "These locks are pathetic," was his only comment as he opened the door that led out to the balcony. Trista watched him pace the length of it, leaning over the railing to look below. When he came back, he was shaking his head. "Who ever it was has managed to make a pretty clean getaway. Did you get much of a look?" Trista shook her head. "Not really. All I saw was a dark human shape." "Could you tell if it was male or female?" "Not really. I guess I assumed it was male. He looked pretty large to me, maybe that was why." Trista pulled her legs up and rested her chin on them, tensing her muscles, trying to stop the trembling. She felt Morgan rest his hand on her shoulder again and instinctively she closed her eyes, trying to will away an unaccountable desire to weep. "It's okay, Trista. You're safe now." His words were so gentle, his touch so comforting, it made her want to cry all the more. She bit the inside of her cheek. Hard. And took a deep breath. "Thanks for coming so quickly." "No problem. I was in my car when you called, on my way home." The pale light from the window threw stark shadows across his face, emphasizing the sharp angle of his cheekbones, the straight line of his nose, the determined set of his jaw. He looked tired, but that was often when she found him at his most attractive--had found him, she meant. Coming home from a late shift, dark stubble on his chin, the stamp of danger from the street still clinging to him. So often he'd woken her, needing the sanctuary she offered, and she loved those dark passionate nights most of all. Had. Trista repeated the word to herself, emphasizing the past tense, drawing a halt to the senseless reminiscing. This is what she had been afraid would happen if she saw too much of him. She would remember...she was remembering. Suddenly she became aware of her own disheveled appearance. Hair tangled and tousled. Not a trace of makeup. This old rag of a sweatshirt. And no jeans. Lord, she'd forgotten. Morgan was standing by the entertainment unit now. He probably hadn't noticed. Fat chance. Morgan noticed everything. "Could you toss me my jeans? They're on the table." He glanced at her then, his gaze sliding slowly down the length of her legs. Awkwardly she shifted in her seat, tugging the sweatshirt around her bottom. A moment later, he tossed the folded denim jeans onto her lap. The cushion beside her caved in a Morgan sat down beside her, close enough that she could feel the heat of his body. She took another sip of brandy, closing her eyes to savor the warmth as it flowed into her still-weak limbs. "You were working late," she said. She had this crazy urge to snuggle in close and lean her head on his shoulder. Dangerous thoughts. Morgan was the last place she had any right to look for comfort. "Hazard of the trade." He leaned forward, supporting his forearms on his thighs, so that she couldn't see his expression. "What's under your sweatshirt, Trista?"